Hempstead, Texas – Texas 4-H and UnitedHealthcare joined together on August 17 to launch a new partnership – Youth Voice: Youth Choice – a program to help young people in the state improve their health and well-being through exercise, proper nutrition and attention to personal safety. 4-H programs in Texas are conducted through the Cooperative Extension Program (CEP) at Prairie View A&M University and Texas AgriLife Extension Service. Nearly 200 parents and kids joined Texas 4-H leaders for a daylong Waller County Healthy Lifestyles Family Fun and Fitness Day held at the newly opened Hempstead Recreation Center as UnitedHealthcare presented Texas 4-H with a $65,000 check to mark the beginning of the partnership. 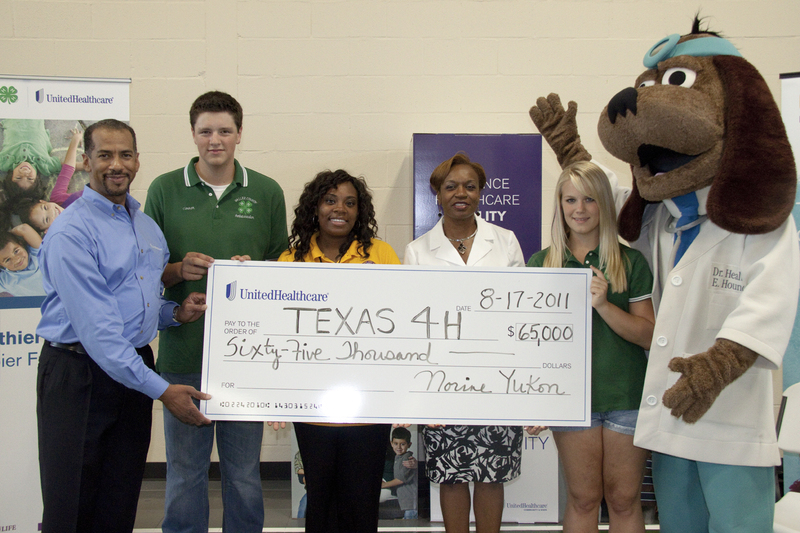 UnitedHealthcare vice president for Community Development-Community & State, Carl T. Kidd, left, presents $65,000 check to Prairie View A&M University Cooperative Extension Program associate administrator, Dr. Carolyn J. Nobles, 4th from left, launching the new partnership between Texas 4-H and UnitedHealthcare for Youth Voice, Youth Choice. Te'Anna Reed, CEP Extension agent, 3rd from left, and Dr. Health E. Hound along with 4-Hers are also on hand to accept the check. 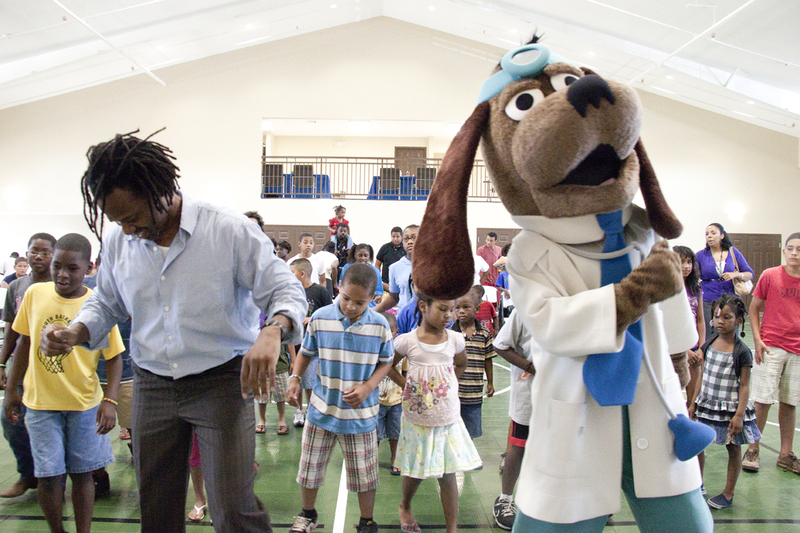 To officially kick-off the partnership, UnitedHealthcare’s Dr. Health E. Hound mascot joined Houston-acclaimed “Strictly Street Salsa” instructor Raul Edwards in leading participating families, community leaders and 4-Hers for a group “Lose It to Salsa” dance exercise, learning fun and easy ways to stay fit. “Since there is a national focus on healthy lifestyles for young people, this partnership between UnitedHealthcare and Texas 4-H is ideal and gives us the opportunity to work together with parents and youth to promote the benefits of good nutrition and exercise,” said Dr. Carolyn J. Nobles, associate administrator for the Cooperative Extension Program at Prairie View A&M University. The Waller County Family Fun and Fitness Day, organized by Prairie View A&M University Cooperative Extension agents, Jernard McCray (4-H), Te’Anna Reed (Family and Consumer Sciences), Kenneth McCullough (Agriculture and Natural Resources) and UnitedHealthcare, included healthy workshops, family physical activities and a healthy lunch with food-preparation tips. UnitedHealthcare provided a certified health educator who answered questions and provided information about health topics such as diabetes, weight control and fitness. The event focused on the importance of diet and exercise in people’s daily lives and how to apply that knowledge with their families and friends in their communities. It is one of several events targeting underserved communities in Texas with nutrition and wellness messages. “The partnership with 4-H and UnitedHealthcare is significant because it’s important to bridge the health disparity gap by engaging our target audience in healthy activities that will hopefully result in behavior changes around eating habits and physical activity,” said Dr. Rukeia Draw-Hood, program leader – 4-H, Cooperative Extension Program. The Texas Department of Agriculture also participated in the event by providing information on Agriculture Commissioner Todd Staples’ 3E’s initiative. choices are not only beneficial to individuals and future generations, but also to the health of our economy. A healthy population is more productive, more competitive and far less likely to burden our health care resources. I commend Texas 4-H and UnitedHealthcare for bringing this positive message to our youth. Raul Edwards, Houston acclaimed salsa dance and exercise instructor, leads group in a rousing "Lose It to Salsa" exercise. physical endurance, muscle gain and increased range of motion while learning to dance. Acting Dean of the College of Agriculture and Human Sciences, Prairie View A&M University–Dr. Richard Griffin, Hempstead Mayor Michael Wolfe and Prairie View Mayor Frank Jackson participated in the activities, along with other community leaders who attended the announcement. Attendees were also provided a healthy lunch with tips for good nutrition and wellness. The announcement is part of a national partnership between the National 4-H Council and UnitedHealthcare. Texas 4-H is one of three states receiving funding from UnitedHealthcare for the pilot program. The grant will support events and activities designed to develop and enhance healthy living through afterschool programs, health fairs, camps, clubs, workshops and educational forums. 4-H youth leaders will serve as ambassadors, helping to lead programs that encourage young people to take action for themselves and their families, and to promote healthy living in their communities through nutrition literacy, physical fitness and personal safety. Texas, along with Mississippi and Florida, were selected for the UnitedHealthcare pilot due to high incidences of obesity among children living in these states’ underserved communities. As part of the partnership, each state 4-H program is developing action plans with targeted goals and outcomes to provide innovative, hands-on learning approaches that target specific community needs. The results will be measured and shared with community leaders, providing other organizations the opportunity to learn and implement similar programs in at-risk communities. As part of the Youth Voice: Youth Choice partnership, 4-H will sponsor events and activities in targeted counties in Texas. For example, Prairie View Cooperative Extension is planning additional family fun and fitness days in Wharton County and healthy cooking events in Fort Bend and Waller counties. Additional events include nutrition education at youth camps, youth fitness activities at county fairs, student workshops, and other events at community health fairs and schools. The partnership is being managed jointly between the Cooperative Extension Program at Prairie View A&M University (Contact: Gail Long, 936.261.5119) and Texas AgriLife Extension Service (Contact: Courtney Dodd, 979.845.6533) in coordination with UnitedHealthcare–Texas. spending, according to America’s Health Rankings®. America’s Health Rankings is an annual comprehensive assessment of the nation’s health on a state-by-state analysis. It is published jointly by United Health Foundation, the American Public Health Association and Partnership for Prevention. 4-H nationally reaches more than 6 million youth each year through clubs, camps and school enrichment programs. UnitedHealthcare Community & State, UnitedHealth Group’s government-sponsored health care program, serves more than 2 million children in 24 states and the District of Columbia in Medicaid and CHIP. 4-H and UnitedHealthcare share connections with many of the same community-based organizations, including school districts. 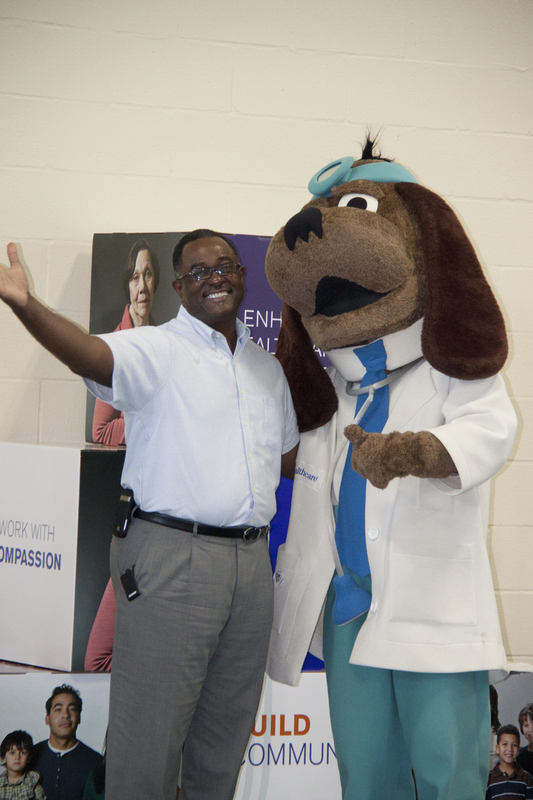 Prairie View Mayor, Frank Jackson and UnitedHealthcare's Dr. Health E. Hound greet Waller County Family Fun Day participants. More than 65,000 Texas youth are enrolled members of 4-H community clubs in Texas. Another 850,000 Texas youth get involved in 4-H through special educational opportunities at school, in after school programs, or at neighborhood or youth centers. Texas 4-H programs are conducted through the Texas AgriLife Extension Service and the Cooperative Extension Program at Prairie View A&M University. These youth live in cities, suburbs, small towns and rural communities. 4-H gives them a chance to pursue their own interests – from photography to computers, from building rockets to raising sheep. A list of 4-H projects is available online. They go places – to camp, to state and national conferences. They learn to be leaders and active citizens. In 4-H clubs, they serve as officers and learn to conduct meetings, handle club funds, and facilitate group decision-making. In a growing number of communities, 4-H youth serve as youth representatives in municipal or county government or as members of Teen Courts. They give back to their communities. 4-H members get involved in volunteer projects to protect the environment, mentor younger children and help people who are less fortunate. For more information visit www.Texas4-h.tamu.edu. This entry was posted on Friday, August 19th, 2011 at 5:31 pm and is filed under 4-H & Youth Development. You can follow any responses to this entry through the RSS 2.0 feed. You can leave a response, or trackback from your own site. Its a great idea for the youngster .I agree with you.Thanks for sharing this informative blog.i really like this thought.